Well, actually, my ONLY Reese piece, at least in finished form anyway, although I went through several rough attempts before I thought I was getting closer. 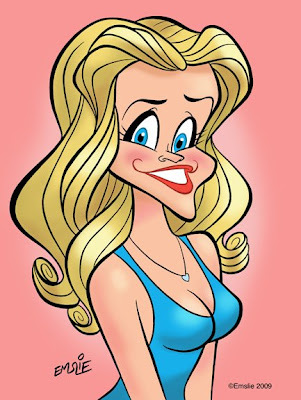 Reese Witherspoon was the NCN birthday subject about a week ago, but I didn't get my picture done on time to post it on that day. 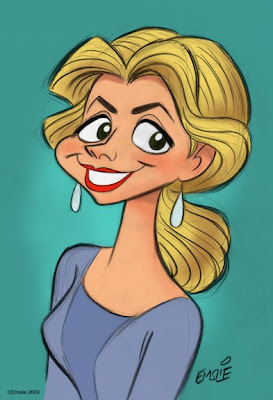 I watched my DVD of "Legally Blonde" in order to do the sketch, although it went through several revisions at the pencil stage before I committed it to the ink and colour version you see here. She was actually much harder to draw than I thought she'd be, and I'm still not sure it's as good as I'd like but I'm posting it here anyway. 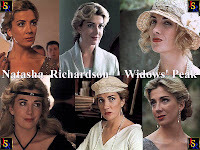 Such sad news with the tragic death at 45 of Natasha Richardson yesterday. A lovely, elegant woman with a rich lineage of movie/stage royalty. She hadn't made a lot of films, but I made a point of watching my favourite tonight in order to do this sketch in tribute to her. 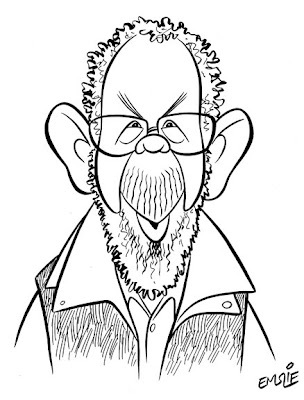 This drawing depicts Natasha as she appeared in 1994's "Widows' Peak", a sly little tale set in Ireland, in which she costarred alongside Mia Farrow and Joan Plowright. 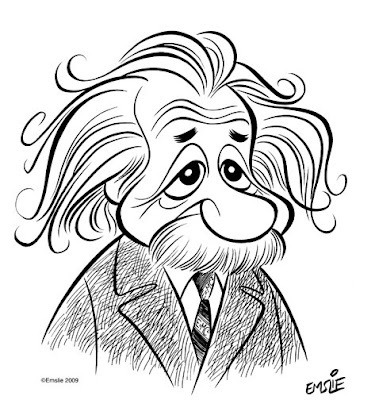 Trivia: Did you know that comedian Albert Brooks is the brother of comedian Bob ("Super Dave") Einstein, and that the family name is actually Einstein? Yep, Albert Brooks' real name was originally Albert Einstein! 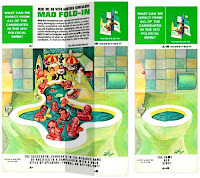 No foolin'! Today is the birthday of Bobby Driscoll, who had a memorable career as an impish child actor, but whose life ended all too soon and tragically in 1968 at the young age of 31. After some years of drug and alcohol abuse as a young adult, Bobby was finally able to clean himself up, yet found himself shunned by the entertainment industry and unable to get work. How different it is nowadays, when even repeat offenders like Robert Downey Jr. seem to get welcomed back into Hollywood's arms for an infinite number of second chances. Bobby Driscoll was never given a second chance though, and he died impoverished after having shown such promise so early on in his young life. Bobby will always be closely associated with Disney for such films as "Song of the South", "So Dear to My Heart" and "Treasure Island". 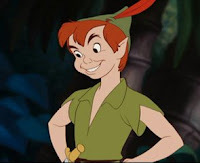 But I like to believe that he has also achieved a cinematic immortality as the voice and live film reference model for Disney's animated classic, "Peter Pan". 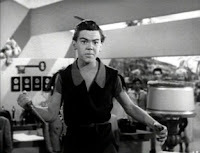 As you can see in this still from the film, Pan was essentially a caricature of the then teenaged Bobby Driscoll, with his pixieish face and smile. 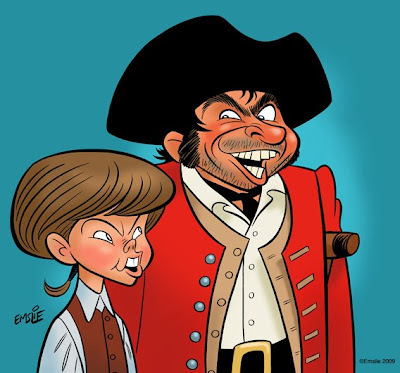 I watched "Treasure Island" again a few nights ago in order to draw Bobby Driscoll, and he really was something as the brave Jim Hawkins, who wouldn't go back on his word, even if it meant acting in good faith with the wily but charismatic pirate, Long John Silver. Long John was played by British actor, Robert Newton, who coincidentally also had a problem with alcohol abuse and died at the relatively early age of 50. Newton is a joy to watch in his role as Silver though, with his bright eyes glinting in both menace and mischief, and speaking in a Cornish accent that became the stereotypical pirate "voice", still imitated to this very day. His final role was playing Mr. Fix, the inspector who doggedly pursues Phileas Fogg in "Around the World in 80 Days". So let's celebrate both Bobby Driscoll and Robert Newton on this day - two actors who left us far too early before realizing their full potential.